Fundera has a killer B2B SEO strategy. They’re one of New York’s fastest-growing startups, and they get more than 800,000 visits a month from organic search traffic. 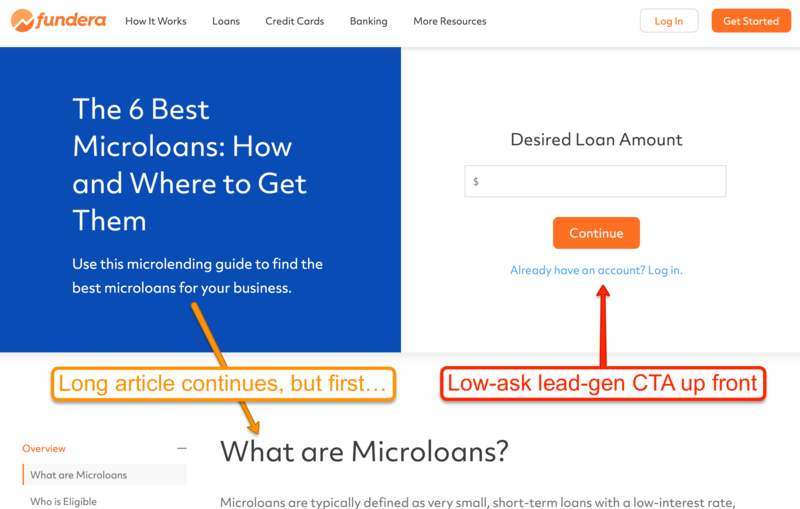 In case you’re not familiar with Fundera, they’re a website that refers businesses to lenders, banks, and other financial companies. They get tons of traffic, match businesses to lenders (or alternative sources of financing), and then collect a referral fee from those lenders. Their business model is similar to that of NerdWallet—who also has a strong SEO strategy you can learn from. 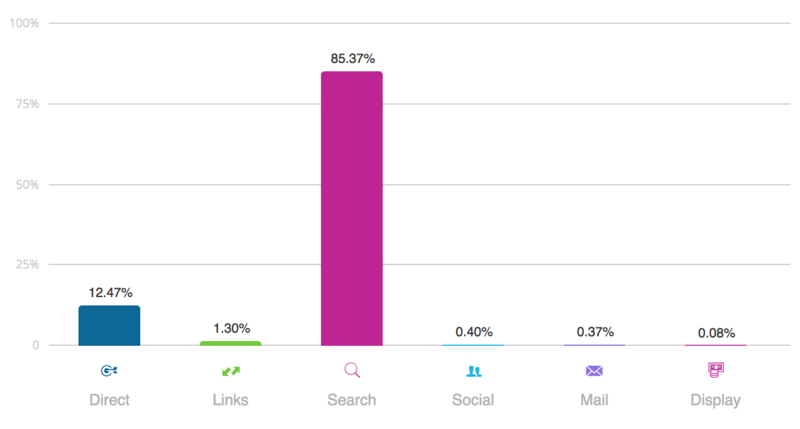 Like NerdWallet, most of their traffic comes from search. 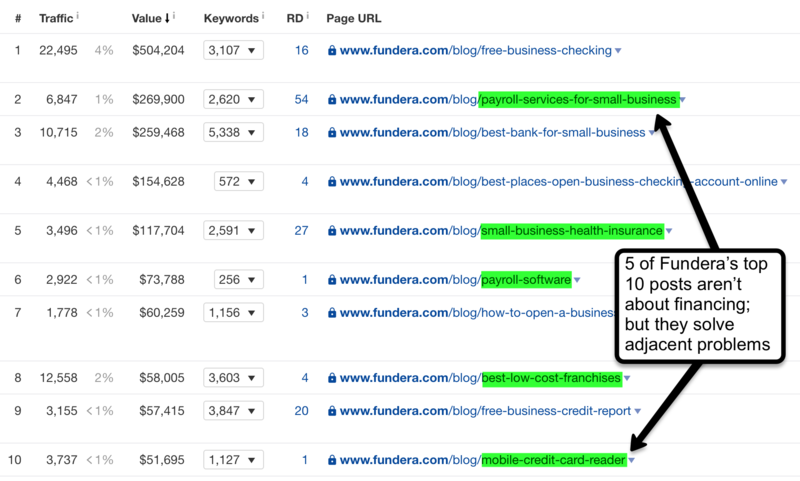 And it’s far, far more organic search traffic than the startups who are actually providing the loans. So what’s working so well for Fundera? We’ve found four takeaways that any B2B company in a competitive space can learn from these folks. And here’s the kicker: they even rank for “business loans” in general. This kind of search traffic is super expensive to purchase via Google Ads—but most of the clicks are going to the organic spaces. How does Fundera do this? For a while now, content strategists have published one long-form page on each topic they want to build authority in. After this, they write several articles related to that topic—articles that explore more detailed, nuanced, or relevant takes on said topic. Then they link those smaller articles to the long-form page. In 2017, HubSpot started calling this the “pillar-cluster” strategy … so that’s what it tends to be called now. The long-form pages are called “pillars,” and the related articles form “clusters” of topical content. Those pieces of topical content are often regular blog posts. It’s common for content strategists to build a single pillar page per topic, and then blog, blog, blog until that pillar page ranks. But Fundera takes an even more pillar-forward approach. 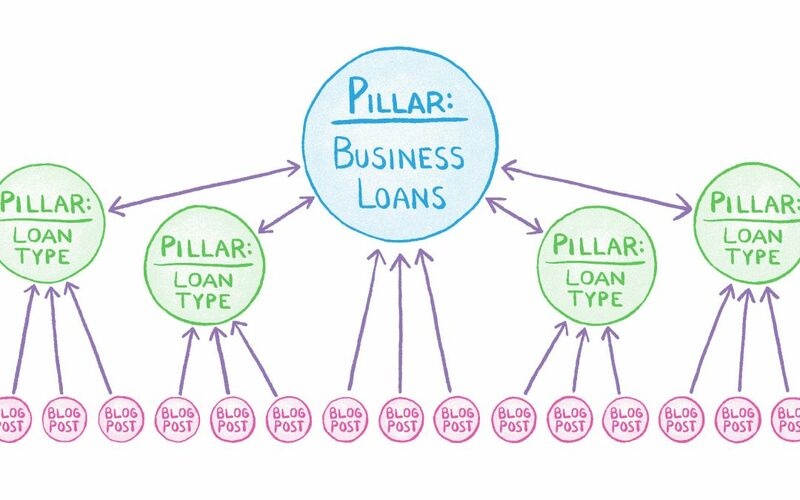 When it comes to business loans, they’ve built pillars on their pillars. 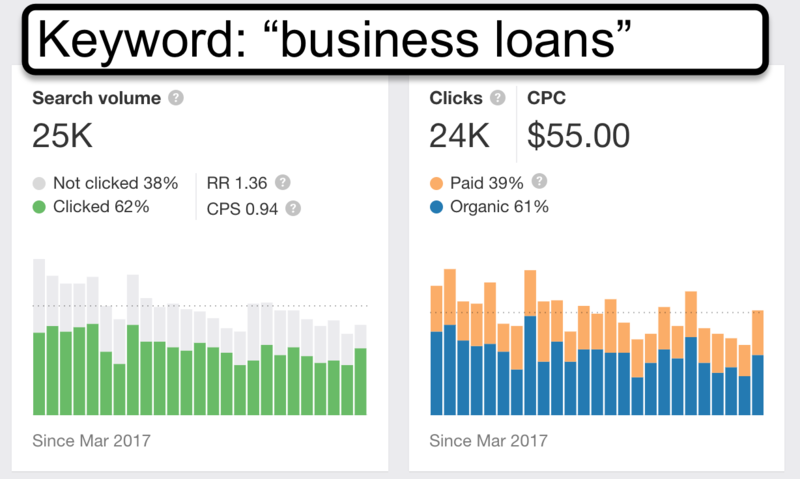 Most of Fundera’s traffic comes from people using Google to research business loans—and there are all kinds of business loans. 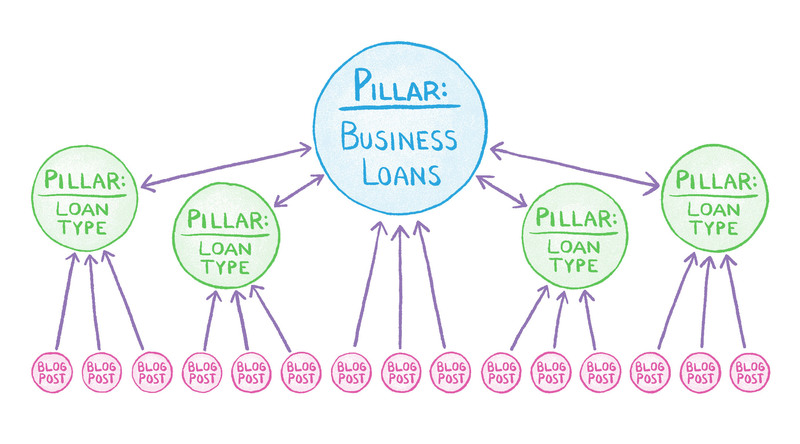 So instead of one pillar page on business loans, Fundera has ten: a general business loans pillar and then nine more pillar pages, plus nine pillar pages covering individual types of business loans (or similar financing methods) in-depth, including SBA loans, business lines of credit, and startup business loans. And when they publish new blog posts, they link to the appropriate pillar pages whenever the loans come up. It all comes together to give Fundera an authoritative, interlinked library of business loan resources. Fundera’s all about helping businesses with their finances—but their blog isn’t limited to those topics. Look through the blog and you’ll find articles on starting a new business, sales and marketing, expanding operations, and becoming a better business manager. And in terms of organic traffic, the blog does most of Fundera’s heavy lifting. This is one of the qualities that separates the great content strategies from the mediocre: great content strategies solve problems adjacent to their own solutions. It’s common for companies to blog about what they do, and how they can help their audience. But a smart content strategist knows that building an audience from organic search often means getting in front of them before they’re in the consideration stage for a given product or service. The idea is that if you want to attract a type of audience, you publish content that solves problems that audience faces. They don’t have to be problems that your product solves. They just need to be problems your target audience is responsible for solving in addition to the stuff that you can help them with. This way, you’re establishing a first touch with people in this audience—even if they’re not shopping around for your solutions just yet. That’s why the mattress company Purple writes about mattress types that they don’t even sell. Fundera does this quite handsomely. 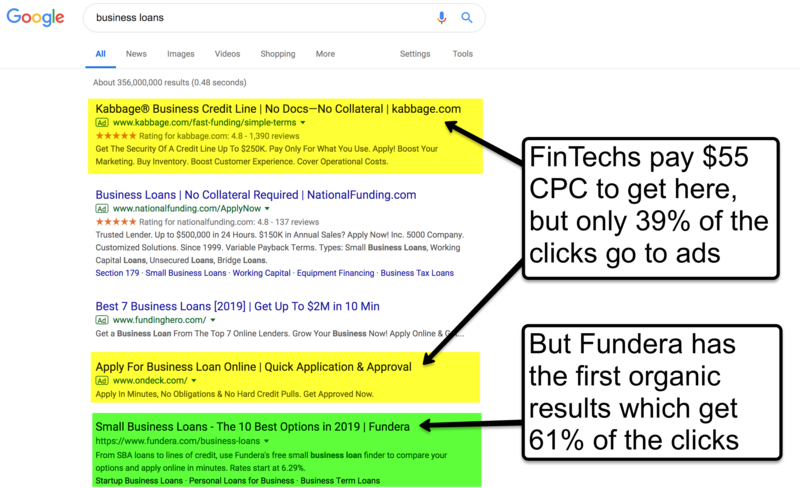 In fact, some of their most valuable SEO posts have nothing to do with business financing at all—they just help business managers solve typical problems that business managers might turn to Google for help on. Data from Ahrefs. “Value” represents the estimated cost of the same organic traffic if acquired by PPC ads. Other companies pay big money to get this kind of traffic from PPC ads, but Google just hands the readership over to Fundera for content like this. You can do something similar. Make a list of the problems your customers solve—and then write content that helps them with these problems. Not only does it help you reach your prospective audience organically, but it’s also the kind of content that’s useful for engaging your leads and customers, too. This is one of those “Of course—why didn’t we think of that before?” SEO strategies. When you’re writing any authoritative article, you’ll usually cite your sources. (If you’re honest.) That means a great way for content marketers to gain backlinks is to become a commonly-cited source. Having a list of current statistics on a topic is a terrific way to do this. It’s worked for Fundera, at least. Three of their ten most linked-to pages give people statistical information that they’re looking for. 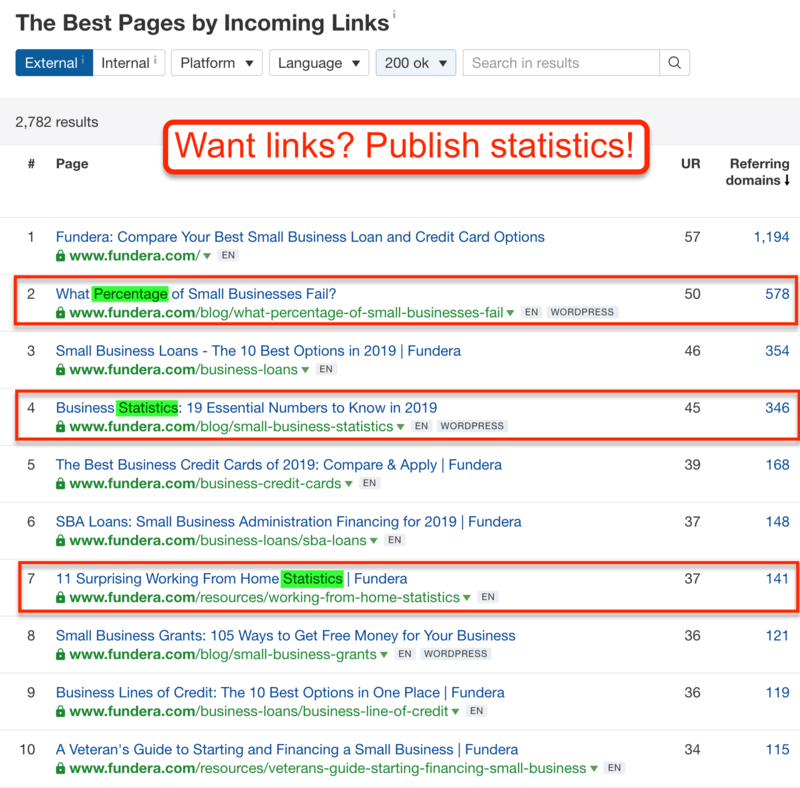 Stats represent some of the most linkable content on Fundera’s site. Fundera gets a ton of traffic, and they don’t dally about telling their visitors where they are and what they’re going to experience. For most of these articles, visitors will be met not only with a title and subtitle, but a soft call to action to begin the process of inquiring about a loan. It’s not intrusive, and it allows anyone with business loans on their mind to jump right into the process. A simple question. Easy to skip if it’s irrelevant, hard to ignore if you’re in the market for a loan. It’s brilliant, because it’s not demanding any personal information up front. All Fundera wants to know is whether or not you want a business loan—and if so, how much? Fundera sprinkles some tasteful scrollovers into their content, too. After you’ve read past a certain point on the page, you’re asked again how much money you’d borrow if you could. They’re not nagging you about an email list or an ebook. You’re either an interested lead or you’re not. Fundera gives readers plenty of opportunities to signal their interest in Fundera’s main services. But they don’t stop at clearing things up for the business. Fundera also does a great job of showing the reader what sort of ground a piece of content is going to cover right up front. 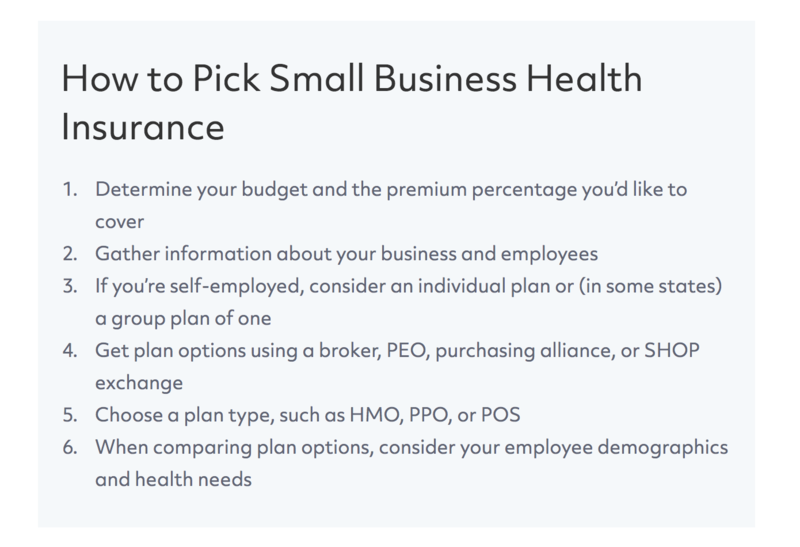 Many of their guides and pillar pages come with a succinct table of contents or overview at the beginning—one that quickly gives the reader an idea of whether or not they’re in the right place. This is the beginning of one of those pillar pages we looked at earlier in this teardown. The article is more than 4,000 words long—but they give you an overview of the points right away. This probably isn’t getting more traffic in the door for Fundera. But giving readers a good experience is always a smart thing to do—especially if they’re met with a longer-than-expected article to read. 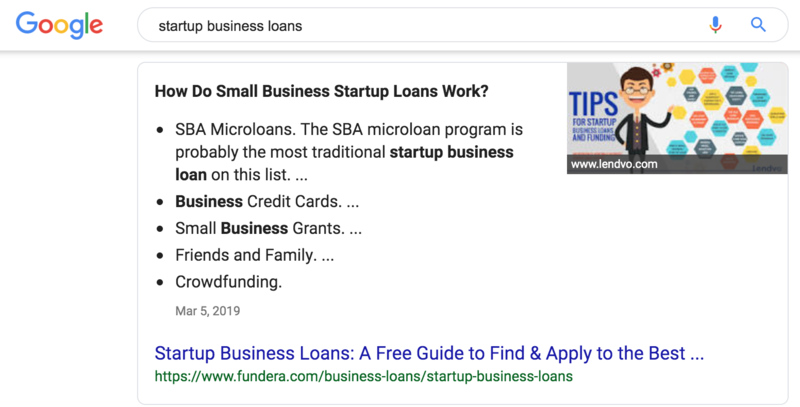 Fundera has built a powerful SEO engine by identifying topics that matter to their audience—and steadily building a library of interlinked pillar pages and guides around those topics. You can do the same. Build strong pillars—and if it makes sense, build pillars on those pillars. Blog about problems that your audience needs to solve, whether or not your product helps them with it. Publish content that other writers will want to reference (statistics are particularly helpful for Fundera). Give readers a fine experience, and make it easy for them to do business with you once they arrive on your site!